Amr Gamal, Yemeni director and writer, was born in Posnan, Poland 1983. He started his career as a short story writer then later switched to writing and directing theatre plays. He received the trophy of the president for best theatrical script in Yemen, becoming the youngest to win it. In 2010, Amr added television directing to his list of achievements, offering a number of TV series while also focusing on theatre activity. In August 2018, his movie "10 Days before the Wedding" was premiered to be the first Yemeni commercial movie to ever hit the local theatre. 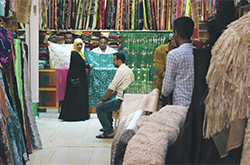 As life slowly returns to normal in the recently freed city of Aden, A number of obstacles stands in the way of a young couple as only 10 days are left for their wedding, each obstacle is in one way or another caused by the aftermath of the 2015 war in Aden; today's temporary capital of Yemen.